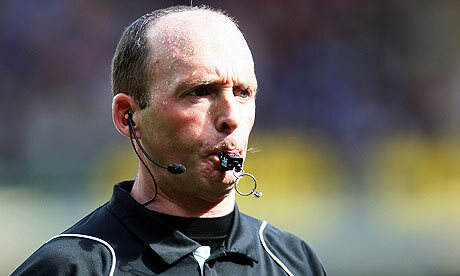 Mike Dean has refereed 32 games involving Arsenal since 2000. Of these 32 games we have won 14. In total since 2000 in games not involving Mike Dean we have won 256 and not won 162. Interestingly for anyone who understands statistics one can do a very simple and straightforward statistical test on this data to see the chances that we are less likely to win with Mike Dean refereeing is down to bias or chance. I have plugged the numbers in and the outcome is remarkable. The number that comes out is 0.06, this basically means the likelihood that this statistic is down to chance is 6%, or 6 in 100. If one looks at the matches Dean has refereed it is not a skewed sample, this is either down to chance or bias, and the odds are that it is bias. The statistics show that it is 94% likely Dean's bias accounts for our poor record under his decision making. I am not a fair weather fan, so what I am about to say is not just the ranting of a bitter and twisted fool, it is the frustrated ranting of someone who always tries to give people the benefit of the doubt and a fair chance. Firstly well fought QPR and a good three points for them. We have no one to blame but ourselves. The decision from AW to start Aaron Ramsey in the team in a wide forward role was many things. It was inexplicable given we had Gervinho and Ox on the bench fully fit. It was foolish given we needed pace and width, especially away from home with the chance to counter attack. It was just such an obvious error from the manager. Ramsey has not even been on form recently, in fact the opposite. Even someone like Yossi Benayoun would have given us far more in that attacking role. Ramsey is a decent young central midfielder and his deployment today was a stupid mistake. Even with the right XI maybe we wouldn't have won, I still think we would have had a much better chance, our lack of an outlet on both flanks was so obvious today. The two defensive errors from Thomas Vermaelen were poor, they were individual errors, these things happen, I will not castigate a man who has been outstanding in recent weeks for us. We need to finish strongly if we are to hold on to 3rd spot, three points today would have put real pressure on Spurs, as things stand we have given them hope and this was such a cheap loss of points. We play City next Sunday and if Ramsey starts on the left of the forward line, I will despair, I just cannot understand how such an experienced manager can make such terrible tactical decisions? We travel away to QPR today and although it should be three points on paper, I am sure Arsene will be repeating himself to the players in saying that we need to be fully committed in every game and if we are not, then we will slip up and drop points. QPR are no great side but it is a London derby game with the hosts fighting for every point they can get to try to avoid the drop. Cisse's suspension is a good thing, he is a quick and dangerous forward. Our injury list is shortening and this has surely been one of the key reasons for our resurgence, we had such a horrendous run of injuries earlier in the season, particularly at full back. I'd hope Gibbs would keep his place, the rest of the defence is obvious, then I would hope that Rosicky would play alongside Song/Arteta in midfield, with either Gervinho or the Ox in the forward line alongside Theo/RVP. The sounds coming out of the club about our proposed ins and out are very encouraging, as many of us would have demanded and hope, the lessons from last summer appear to have been learnt. Arsene has made it clear that his priority is to tie down RVP/Theo/Song to new long term deals, while getting rid of the squad's unwanted dross (Vela/Denilson/Bendtner/Squillaci/Almunia/Chamakh et al). It also appears that the club wants to get moving early in the market and not leaves things to the last minute, the Podolski story is gathering momentum and he would be a very useful addition to the squad. Finally one can't help but notice the fact that UEFA are a bunch of corrupt cronies. UEFA's kangaroo court has again found Arsene guilty of daring to speak to the referee and dished him out a ridiculous punishment. He is going to appeal but it seems pointless, it's a bit like appealing something dished out by the Stasi, you know it's unfair but the corrupt cretins in charge will not change their minds. In the context of other managers like Guardiola doing far worse and not even being charged, one has to question the objectivity of UEFA in the way in which it selectively punishes individuals. It is also strange that Barcelona seem to get such favourable treatment, for example how did RVP get sent off for nothing last season while three Barca players grabbed our players by the throat without any punishment? Have a read of this interesting UntoldArsenal piece, it really does make you suspect that the game is not quite as clean as some would pretend. Midway through the second half I just noticed how hard the team were working, how hard we were pressing and how much better we were without that ball that we had been earlier on in the season, it was a slightly strange moment, and it was a strangely satisfying one, it showed to be just how far we have come in the last few months as a team and as a footballing unit. Of course Villa are a deeply average side, they have precious little top quality and a lot of rather mediocre niggling physicality, all very much in the image of their dire manager. However the way in which we dismantled them was still pretty impressive, Villa couldn't get a look in, Gibbs early goal and Walcott's well taken second were fully deserved, Villa struggled to move the ball around effectively on the rare occasions that they had it, we swarmed around them and forced them into repeated errors, our work rate and pressing was fantastic particularly in the first half. In fact two nil was pretty flattering for Villa, it really could have been completely done and dusted by the break. Although the game to fizzle out a bit in the second half and we did lose a little bit of concentration, Villa consequently created a couple of openings and they could have made things slightly nervy had they taken advantage. In the end though they didn't, Arteta ridiculously powerful and precise twenty five yard free kick was as good a set piece goal as you will see all season, unbelievable and a nice gloss on a good all round team performance. Arsene is also looking more like his old self again, he knows we should not get carried away, we need to keep working hard and giving everything in every single minute of every game that we have left this season, Arsene has realised a key behind this turnaround has been a better work ethic, more discipline and more commitment from the players. In recent years we have lost too many games without even putting in the effort and that appears to have stopped, complacency has to be continually resisted and this lesson finally seems to have been learnt. The positive signs are that we have also learnt from last summer's transfer shambles, we seem intent on avoiding close season disasters this time around, the key now is to fight for every ball from now til May, we need a squad with the right ethic and the right work rate, and things are looking good in this regards at the moment. That wasn't relaxing but it was a massive win, especially in the context of Chelsea and Spurs dropping points, we are now in a strong position in fighting for 3rd place, not something some of us would have believed a few weeks ago. Arsene made the interesting move of dropping the Ox to the bench, with Rosicky moving forward into the front three and Aaron Ramsey into the midfield three. We hammered Everton early on and it was frustrating that we didn't go more than the single goal ahead, Ramsey squandered some great chances, as did others, the football was so slick and fast, probably amongst the best twenty minutes of football we have played all season. Everton did come back into the game and we were extremely lucky to see Drenthe's equaliser denied by the linesman's erroneous flag. Other than that we defended solidly and well deserved the one nil lead on the balance of play. The second half saw us drop a bit deeper and play a bit of a dangerous game, fortunately we defended well enough to keep Everton out and the hosts just lacked that bit of quality up front to convert the pressure they had into goals. The whole defence were outstanding, we competed so well in the air, defending numerous crosses with real confidence, the offside trap was also rather polished, the annoying and gravity prone Jelavic was correctly flagged off several times in the second half alone. The ref Mason did ok too, other than being too lenient with the nasty Cahill, he let the game flow pretty well on the whole. We should have made the game safe, RVP missed a particularly good chance in the final ten minutes, having been set up by Gervinho's excellent low centre, but we held out nonetheless, a really good show of defensive strength and character, and another away win. It must be said that Tim Howard was top notch in the Everton goal, two saves stood out, one from RVP's low shot in the first half and one from Ramsey's low effort in the second half, he kept Everton in the game at times. There is a real confidence flowing through the side at the moment and hopefully this in combination with our reducing injury burden can result in the positive momentum continuing to gather in our league run-in. Defensively we have made real strides since the start of the season, the work rate was also far better in the midfield areas, Arteta was great on his Goodison return. I have to say I was not convinced by playing Rosicky and Ramsey in the same side, I don't think both of these players are far better in central areas. Anyways, great win and three points, come on you Gunners! Fabrice Muamba collapsed on the field today at the end of the first half at White Hart Lane. Resuscitation was attempted on the field and he was rushed to hospital, the game was sensibly aborted. All our thoughts are obviously with Fabrice and his family. It is worth remembering how relatively unimportant football is at times like this, and it is also worth pointing out just how fantastic the Tottenham supporters were, chanting Muamba's name and applauding him off the field. We are all fellow human beings and at times like this we should all pull together, let's just hope Fabrice can pull through. I shall keep this brief but what a great fighting performance that sums up how far we have come in recent months. The only change to our eleven saw Arteta return in midfield with the Ox moving into the front three in place of Gervinho. To be fair to Newcastle, they did start very well and looked dangerous in the first fifteen minutes or so. They took the lead when Vermaelen sloppily gave the ball away, Gibbs was badly positioned and Ben Arfa had too much time and space, he took his chance expertly and cut inside, blasting past Szczesny at his near post. From that moment on there was only one team that looked like winning, we stormed up the other end, Theo fed RVP, he slipped inside Williamson and cracked home the important equaliser. We dominated the rest of the first half and continued in this vein all second half, we huffed and puffed, and it looked like we might never get that little break in front of goal. In the end it came when many of us had almost given up all hope, Vermaelen steaming in at the back stick to bury the ball with his right foot, 2-1 and what a win. It was very satisfying and fully deserved. Rosicky had been awesome, spinning this way and that, running the show in midfield, it was a really good performance from many others too, Theo was particularly sharp in my opinion. We had had the chances to win the game before Vermaelen's winner, RVP and Gervinho with the best of them. One cannot feel sorry for Newcastle too, their persistent time wasting was rather pathetic and Krul got his just deserts, pick that one out! That was so much better than the first leg, there's just no getting around that and it was just a terrible shame that the first leg deficit was too big to claw back last night. The commitment and tempo were there, as was the organisation. The first half was terrific, we played Milan off the park and thoroughly deserved the handsome 3-0 lead, and if there was any justice in this world we would have gone on to victory, unfortunately this world is not fair and Milan edged through. At least we can proud of the performance. Although we lost the first leg 4-0 it was nowhere near as one sided as the scoreline suggested, we were just done by some excellent finishing, some terrible defending and a terrible piece of Ibrahimovich cheating, sadly this non-penalty was the difference between the sides in the end. The 3-0 scoreline last night was also slightly flattering as the 4-0 had flattered Milan, the Italians had some great chances to score last night and really should have put the ball in the old onion bag on more than one occasion. The positives were multiple. Szczesny was again solid, the defence worked better together as a unit, catching Milan out with the offside trap time and time again. The midfield were the real difference, Song, the Ox and Rosicky were sensational. The Ox played with a discipline and maturity that belied his years, Song was the machine he can be, and Rosicky was such a spark. The Ox's hamstring niggle really hit us in the second half as we slightly ran out of steam, we didn't have the quality on the bench to change the game and if there can be any criticism, it was again that of our lack of real strength in depth. Theo was dangerous all night long and his performance was a big plus, his pace terrified Milan's defenders. The referee was utterly useless. He carded several of our players for the most mild of fouls, the Milan players were cheating by rolling around theatrically after any kind of challenge for the ball within a mile radius of their legs. He also missed several nasty and cynical Milan fouls, some he didn't even see as fouls, others should have been at least yellows but he preferred to book our players for far less. The best explanation for this kind of biased performance other than UEFA being corrupt, he systematically favoured the away side in a way which was almost bizarre, it is hard to believe that such a poor showing could be down to pure incompetence. UEFA's decision to charge Arsene just makes it all look more suspicious, their hatred of English clubs is summed up by what they punish us for, while letting the big Spanish and Italian clubs get away with far worse. Onto the next one and that is Newcastle on Monday, we need to keep on the shoulder of the spuds and we have a few days in which to recoup. The injuries didn't look too bad, Ox's hamstring must have been very mild as he played on with it, he will also heal quickly being so young, maybe a couple of weeks out maximum, while Theo's injury looked like just a dead leg, hopefully he'll make Monday. Come on you Gunners. "Referees winning the percentage game whatever managers and media say"
Apparently we just have not right to question these 'impressive statistics on officials' accuracy' and anyone doubting them must be cooking up a 'half-baked conspiracy theory'. Interestingly the claimed statistic of 99.3% of offside decisions being correct is not backed up by UntoldArsenal's analysis of these decisions. UntoldArsenal's referee statistics make for far gloomier reading that Mike Riley's. One can see just how weak Riley and the PGMO's case is by the claim that the 'Respect' campaign is working because bookings for dissent are down! This was perfectly demonstrated yesterday by Mark Halsey complete inability to punish Liverpool for some really blatant dissent and intimidation of officials. It is clear that dissent bookings are down because referees have stopped punishing dissent on the whole, things are so bad that if dissent were punished we would sometimes not see a single player left on the field. I have already done a fair amount of research on Mike Riley and the hidden non-transparent workings of the PGMO. It is clear that whatever ones theories on referee selection or referee performance, the workings of PGMO are hidden from public view and their propaganda cannot be trusted. Apparently 92% of the 'major' decisions are correct, but the important thing is according to who? Well, it's apparently down to the match delegates who watch in real time from the stands, this system is obviously entirely useless and the very opposite of objective in judging the performance of referees. UntoldArsenal have done an excellent review of how flawed these statistics from the PGMO are, it's well worth a read. The great irony is that so called 'professional' journalists are invariably quick to criticise amateur bloggers, yet these 'professionals' are repeatedly caught with their pants down around their ankles reproducing propaganda from various official bodies as if it were unquestionable fact. Anyone with a decent brain and a bit of training can tell you that you should always be sceptical of data, one should always look at where the date has come from, the methodology of its gathering, its interpretation and any flaws in this whole process. The mainstream media have yet again been caught producing some very lazy and shoddy work, and then when this is pointed out to them they don't like it. It is clear that so much done by Riley, the PGMO and referees is completely hidden from the public and the media. Whether anything dodgy is going on is unknown, it is just rather obvious that we cannot know either way, too much has not been revealed about the inner workings of the PGMO. The latest round of PGMO propaganda adds nothing to the arguments despite what certain lazy hacks have trotted out in their columns, referee selection and standards in the Premier League are a story that will simply run and run. Another massive three points, especially with Chelsea losing away at WBA, and a big result at a ground we have struggled at over the years. Any Arsenal fan not satisfied after today's showing must ask themselves some serious questions about their own mental state. There were many positives, some negatives, and a lot of big talking points, certainly the absolutely pathetic behaviour of several Liverpool players has again shamed this once mighty and classy club, it was as bad as I have seen from any side in recent years. The first half was generally dominated by Liverpool, but they needed to cheat to get their penalty, Suarez going to ground theatrically (yet again) after the slightest of touches from Szczcesny, justice was done with a great double save. The Liverpool pressure did result in an opener and it was an own goal from the boot of Koscielny, he completely miss-hit his attempted clearance and it gave Szczesny zero chance, apart from that Koscielny was outstanding for the rest of the game. Liverpool could have extended their lead, Szczesny was forced into one excellent low save from Henderson's side footed shot, while the disgraceful Suarez hit a post with the goal at his mercy. However as the half wore on, Liverpool's threat seemed to gradually die and we came more into the game, this was cemented by RVP's fine headed finish from Sagna's outstanding cross, this header came despite the cynical Carragher doing his best to push RVP over in the box. Strangely Liverpool just didn't really threaten us as one would have expected in the second half, there was the odd moment, one brilliant Koscielny clearance saved us from a dangerous low cross from the right wing, but other than that they lacked ideas, imagination and quality. We had the best chance of the half with Walcott's low side footed effort being deflected onto Reina's legs, a good save from the Spaniard. Arteta had gone off with concussion, Diaby came on and did well before going off injured, Benayoun came off to be replaced by Gervinho, the Ox replaced Diaby and did well in a deep midfield role. Then the moment of brilliance, Song took the ball on in the midfield, a solid first touch and then a great chipped through ball for RVP who ran off the shoulder of Carragher, he side footed the ball home with amazing control from a tight angle, Reina's little near post gap was small but RVP found it with such precision, 2-1 right at the end of normal time. There were 8 minutes added on but Liverpool had gone flat, we easily held out and we looked far more likely to score another than Liverpool. 2-1, a cracking away win at Anfield. There are two things I have not mentioned until the end of this piece and if we had lost today, I would be accused of being a moaning sore loser, but with us winning I can point them out pretty objectively. Firstly the referee was utterly useless, Halsey needs to be retired. He was so one sided with the little decisions, he let Liverpool get away with numerous fouls, some small, some nasty and some cynical with virtually no punishment. Spearing's disgraceful straight legged studs up lunge on Rosicky's shin didn't even merit a free kick, whether it was a yellow or red is open to debate, a red would not have been harsh. Halsey also missed a nasty Kuyt lunge with studs through Arteta, it was right in front of the referee and he did nothing. The failure to book Adam for his cynical second half trip of Rosicky was another good example of his awful decision making. The behaviour of the Liverpool players as a whole and the Liverpool manager was beneath contempt for the most part. They questioned every single decision, they intimidated the referee and linesmen persistently from the first minute to the very last. The dissent shown was quite breathtaking and it was so persistent it beggared belief, the referee just let it go, let it go and let it go, it was just amazing. The most blatant bit of dissent was when Kuyt aggressively confronted the linesman and swore at him, amazingly Halsey showed his complete bias or lack of balls and did precisely nothing, yet again. Dalglish was constantly swearing and moaning on the touchline. Adam, Kelly, Suarez, Downing and Kuyt were all guilty of the most blatant of dissent and their antics represent the real 'scum' of modern football for me. It was quite disgraceful and an utterly pathetic example for grown men to be setting to the viewing public which includes a lot of kids. There were a lot of solid shifts put in today, Szczesny and RVP were the stand out performers, the centre backs and full backs were excellent, Song solid, Rosicky good again, Arteta struggled as did Benayoun, Theo did reasonably well. Whatever one thinks we certainly showed a lot of character today to come from a goal down and to win at such a tough away venue. Also spare a thought for the luckless Diaby, such a talented player but his ankle has been buggered by the reckless Neanderthal negligence of others. Well done the lads and Arsene. Not a great Arsenal performance by any means but considerably better than an absolutely terrible half of refereeing from Mark Halsey. Firstly he gave a penalty for yet another piece of Luis Suarez cheating, the man really is one of the least sportsmanlike and biggest cheats I have ever seen on a football field, add that to his racism and you have one of the most vile footballers of all time. He got numerous small decisions wrong and I won't bore you with these, but the fact that he missed two reckless Liverpool tackles that took place right in front of him without even awarding a free kick says it all. The first from Spearing, another piece of proper vile scouser, was a nasty straight legged lunge on Rosicky's shin, it could have been red, at least a yellow, Halsey did nothing. The second studs up lunge from Kuyt on Arteta was not as bad but was a pretty certain yellow and Halsey did nothing. I really struggle with this Liverpool side, they are full of some rather nasty individuals and Steven Gerrard isn't even playing. Carragher does nothing but foul, RVP scored with a header just after Carragher had tried to push him down in the box, an obstruction later in the half on RVP in the box was a clear deliberate foul. Suarez' cheating, fouling and whinging is beneath contempt. Spearing is a nasty violent thug. The rest of them are constantly moaning and intimidating the officials, appealing for free kicks and thrown ins that they know very well are not due. What a sorry state football is in these days, so much cheating and so little sportsmanship on show. I know this is a football blog but sometimes one has to put things into perspective. Events in Syria are absolutely shocking, I would urge everyone to watch the above video of Sunday Times photographer Paul Conroy speaking about the systematic slaughter of men, women and children that is going on there. It certainly puts football into perspective for me anyway. Last weekend was fantastic from a footballing point of view, a great win and a great comeback. However certain things happened at the Emirates which again it all into perspective for me, there is unfortunately often a minority of football fan, that uniquely stupid and unpleasant breed of scum, who has the capacity to take the shine off such a great win. 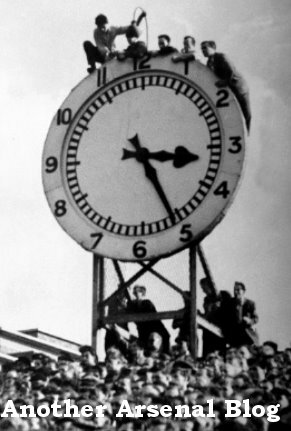 There were some idiots spouting racist abuse, there were some wishing Adebayor dead and there was far worse than this. I hope the club can clear this class of filth out for good, these morons should have no place at our football club. The injury situation doesn't look too terrible for our trip to Anfield, there are doubts over Vermaelen, RVP and Rosicky, but they may well all play. It is always a tough tough fixture and even if Liverpool aren't the force of old, any point at Anfield is always a good one. Anyways whatever happens at Anfield, it is only a game of football, there are many things more important in life.